OVERSTOCK SPECIAL!! - 5 Snow WingBeats for $249.95 with remotes! After you have assembled your decoy you need to sync your remote to the decoy. You may sync multiple decoys to the same remote. With the on button on the remote depressed hook the decoy to a 12 volt battery. Keep the ON button depressed the whole time. After the decoy is hooked up to the battery keep the ON button depressed for 3 seconds. Your remote should function after this process if not repeat. The ON button will keep the decoy flapping continuously. In the INT mode the decoy will flap for a few seconds rest then flap again until the mode is changed. The FLP mode is for using your decoy as a remote flagging device. After you have the decoy on press the FLP button. The decoy will stop flapping. Each time you press the FLP button the decoy will flap for as long as you hold the button down. It will stay in FLP mode until you change modes on the remote. New design for this year includes a remote with an intermittent mode, a momentary flag mode, and an on/off button! AND...Multiple WingBeats can be run off of one remote! This new Improved version also features a quieter motor. 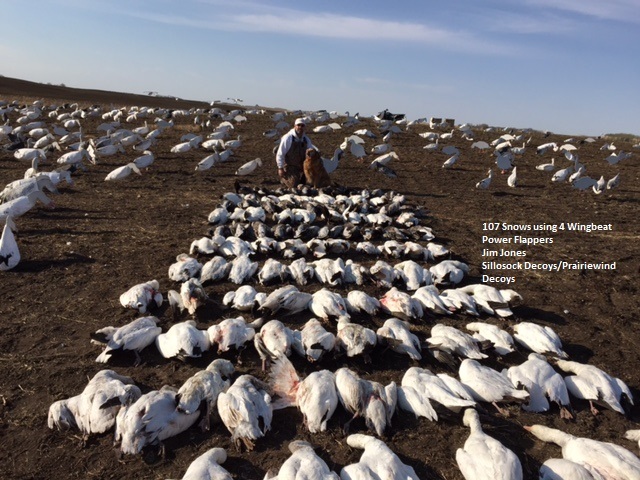 These NEW Wing Beat Snow Goose Power Flappers by Sillosock Decoys are game changers! Imagine flapping wings scattered all over your rig on no wind/light wind days. Then imagine them going on and off intermittently! The birds have never seen this before. We have had great success placing them 50-75 yards upwind of the blinds to draw the birds over the shooting line. This diverts attention away from the shooters....and is a deadly technique! The WingBeat Power Flappers come with a 3 stage switch: on, off or intermittent. Wingbeats are a great way to add realistic movement to any decoy spread. Lightweight, portable, and cost effective. They come with a 15 foot wire to connect to any 12 volt battery. In the "on" position the decoy will flap continuously. In the intermittent mode, the decoy will flap for 5 seconds then off for 20 seconds...... until it is turned off or the mode is changed to full flapping mode. Easily run 6-12 Power Flappers off of one deep cycle 12 volt battery. Wingbeat Power Flappers work with wind....or no wind! "We had great success this spring spreading the Wingbeat Power Flappers throughout the spread to replicate birds stretching their wings on windless mornings. This NEW movement was the key to our success. It was something they had never seen before." **OVERSTOCK SALE** Normally $350/5pk, Now $249.95/5pk PLUS FREE SHIPPING! **OVERSTOCK SALE** Normally $90ea, On sale now for $69.95ea!! Plus get FREE SHIPPING!